Secretary of State Rex Tillerson said Americans should "sleep well at night" after President Trump's threat to rain "fire and fury like the world has never seen" on North Korea. But his reassurances ring empty. The president's deeply disturbing tendency to glorify war has no place in determining our country's use of nuclear weapons. The first, and only, use of nuclear weapons on human beings was 72 years ago this week. We can't do it again. 1. No new nuclear weapons programs. We must defeat proposals to spend $1 trillion "modernizing" the United States' nuclear weapons. 2. No first use. Members of Congress have introduced legislation that would make it illegal for a president to order a first strike with nuclear weapons without a declaration of war by Congress. (The president could still respond to a nuclear attack). 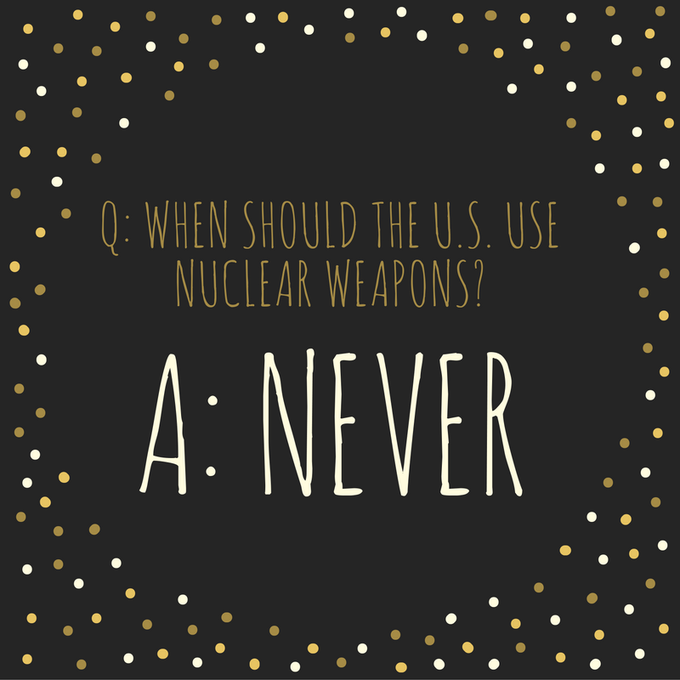 No president should have the unilateral ability to launch a first nuclear strike. 3. Double down on diplomacy. From talks to sanctions, the United States and its allies can continue to use proven, time-tested non-military options to deal with North Korea. We must protect the United States' diplomatic assets - by protecting the integrity and funding of the State Department. The tumultuous events in Congress this summer have shown us that our voices do make a difference. The time to speak is now.